Empower your mind, body, and soul! Step away from the everyday hustle and head North to immerse yourself in a day long yoga retreat. Discover what makes you feel alive, how you can stay centered regardless of the noise around you, and what is possible when your body is grounded and your heart is open. 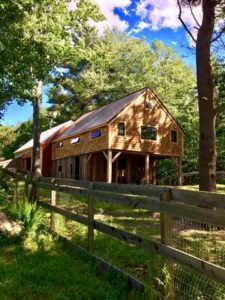 Join Brittney for a day of connection, asana, meditation and personal development in the soulful space of Shilo Farm in Eliot, Maine (just one hour from Boston!). 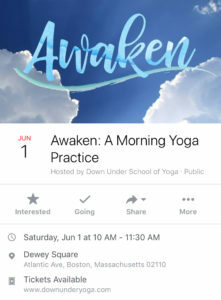 Down Under School of Yoga joins hands with the Boston community and the Rose Kennedy Greenway to offer a full morning celebration of yoga. Join a team of the school’s legendary teachers to unroll your mat, unwind your mind, and unite with breath. This event is free, open to all levels, and guaranteed to be a joy! Bring your mat and your friends! The Lotus Flower arises from the mud, nurtured by light and air and rain until it blossoms and rises on the water. Like the lotus, each of us needs nourishment from the 4 elements to reach our fullest potential. Join Brittney Burgess for a 4 part, seasonal yoga workshop series to discover your own capacity to rise from the mud into the light. These workshops will vary from deeply grounding to highly energizing practices inviting you to discover and embody earth, water, air and fire in your practice and your life! Cultivate the FIRE element in this practice by showing up for a powerful, heat-building flow. Turn your intentions into action, radiate from the inside out and light up your practice, your spirit and your life!! This workshop will empower you to tap into the fire you have within so that you can drop limitations and tap into a deep strength and courage as you create a life that has IMPACT. Through meditation and asana, this experience will awaken your Manipura, or Solar Plexus Chakra.